We’re finally fulfilling my life-long dream of going to France! If I didn’t have the plane tickets as proof, I’d think it was just a dream. But no, I’m really planning a France vacation!! France has always been one of those places I’d hoped to explore, but never imagined I’d actually go. Well, maybe when I was 60, retired and my kiddos had kids of their own. So, how did all this come about? After my back surgery in November 2013 (and even before) I spent a LOT of time laying around in bed. It occurred to me that I might not be able to walk well enough when I’m older to take such a trip. My back will continue to deteriorate and strolling through quaint French towns might not be possible. The more I thought about it, the more I realized that life is too short. Sometimes putting things off until the right time, isn’t the best idea. Will there ever really be a right time? What’s even better than spending 2 weeks in France? The possibility of moving there for a year or two! The more my husband & I talked about it, the more I realized I wanted to live abroad. I desperately wanted to expose my kids to another culture, to another language. Part of me is utterly terrified. I’ve lived my entire life within a 30 mile radius of where I was born. I’d always had my Mom and little brother close by. My husband on the other hand, grew up with a Father in the Navy. He’s lived in multiple states and driven across the US multiple times. His dream has always been to move back to California – across the Country. But I always refused. How could I possibly leave my family? Now, I want to move across the Atlantic ocean! The first step in planning our vacation was deciding where to go in France. Since this is more than just our vacation (it’s also about if and where we want to live), we looked for cities with a large expat community. Next we looked at International Schools. Having 2 kids, school is a major factor in our move. We finally decided on Paris, Bordeaux and Nice. These 3 areas of France are in different areas of the Country, each offering a different way of life. Now to be honest, I doubt we will move to Paris. It’s just way too expensive. I do; however, want to keep that option open AND I couldn’t start planning a France vacation without including Paris! Sooo, we are planning 5 nights in Paris to start off our adventure. Next, we will hop a train to Bordeaux. There isn’t as much to see in Bordeaux, so we are only spending 3 nights. It will give us a chance to check out the city, the school and decide if we could live there. The final leg of our journey is a full day train ride away – Nice for another 5 nights. My husband and I agree that of the 3 cities, we would likely end up living in Nice. Why? 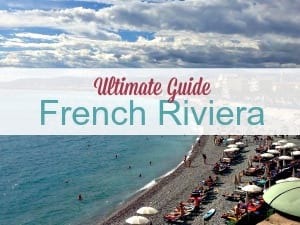 The beach, the weather and it’s the French Riviera! We’ve both always lived by the ocean, so I think that will help in the transition. Additionally it’s a fairly touristy area, so more people will speak English (so we hear). This will help while we are learning to speak French fluently. Those are the 3 cities we will be focusing on as we are planning a France vacation. Next up, I’ll share with you why we decided to try and navigate the France rental apartment scene instead of staying in hotels. Keep up with our France plans and adventures as we take our first European vacation! We purchased the Fodor’s France 2014 to help plan our trip and provide travel ideas. Do you have any suggestions for planning a France vacation?